I have just had your letter of 14th February enclosing the cheque, which I will immediately hand over to Stora, and get him to deposit the relief at your apartment. I am very glad you got it, for it is much finer than any of those shown at the Persian Exhibition.International Exhibition of Persian Art, Royal Academy of Arts, Burlington House, London, January 7–February 28, 1931. See Persian Art: An Illustrated Souvenir of the Exhibition of Persian Art at Burlington House, London, 1931 (London: Hudson and Kearns, 1931). Stora’s reason for not sending it to London was, I think, that he thought he would get sufficient advertisement by sending the less good one while at the same time avoiding arousing the Persian Service des AntiquitésA law for the Conservation of Persian Antiquities was passed by the Persian parliament on November 3, 1930, leading to the creation of the Archaeological Service of Iran, which was part of the ministry of education. See Lisa J. Borodkin, “The Economics of Antiquities Looting and a Proposed Legal Alternative,” Columbia Law Review 95, no. 2 (March 1995): 381. by flaunting something of the very first quality in their faces. As it happens, I hear that the Persian Service des Antiquités has approached the French Government with a request for its collaboration in an attempt to prevent further removals of sculpture from Persepolis.Persepolis, the ceremonial capital of the Achaemenid Empire (ca. 550–330 BCE). Persepolis is situated northeast of the modern city of Shiraz in Iran. Godard,André Godard (1881–1965), a French archaeologist and architect who excavated Persepolis in the early 1930s. He was head of the Archaeological Service of Iran. the head of the Service des Antiquités, thinks he will now get sufficient credits to have Persepolis properly guarded. If he does, it will be thanks to Stora's success in acquiring your reliefs and the others. I enclose herewith Stora’s receipt. Many thanks for returning the photographs of the BrézéChâteau de Brézé, near Saumur, owned by Aline, Marquise de Dreux-Brézé, née des Granges de Grammony. tapestries.Probably from the “Voyage to Calicut” tapestry series. After Vasco da Gama’s voyage around the Cape of Good Hope to Calicut in India, King Manuel of Portugal ordered a series of twenty-six tapestries to commemorate the event from the Tournai tapestry-maker Gilles le Castre. The series was completed in 1504, and due to its popularity, many related pieces were made. See letter of October 4, 1930. Also, for the copy of the letter from the Crown Prince of Sweden.Gustaf VI Adolf (Oscar Fredrik Wilhelm Olaf Gustaf Adolf) (1882–1973), crown prince of Sweden until 1950, when he became king. I looked at the textileThis textile has not been identified. of which you sent me a photograph in London. It is an embroidery, and I do not like it at all. WietGaston Wiet (1887–1971), a French scholar of Middle Eastern languages and history, was a professor at the University of Cairo. is in the Arab Museum in Cairo. He is a good Arab scholar, but knows nothing whatever about art. A rhyton is a drinking vessel ending in the head and fore quarters of a beast, usually a griffin, whose fore quarters form the foot of the cup. I don’t know anything about Kramstich.Roman Kramsztyk (1885–1942), a Polish painter of Jewish origin who died in the Warsaw Ghetto in 1942. He lived and worked in Paris from 1922 and was a member of the New Classicist movement of the 1920s and 1930s. I was much interested by your account of the Revolution and subsequent political developments in Argentina. I think your Epigrammatic historyThis has not been identified. contain all the essentials. 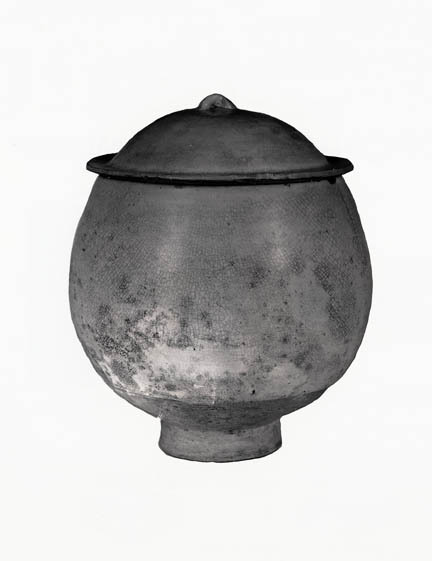 To return to the Persian Show, I have not the faintest notion why Pope insisted on taking the Tang white bowl. I drew his attention to the fact that it had nothing to do with Persia, but he insisted on taking it. He did not expose it, however. I told him that the Turban was at his disposal, but, marvellous [sic] to say, he did not want it, though he had nothing at all like it in the Exhibition. The nearest thing was the little blue garment which Mallon had at the same time as the Turban, and which now belongs to the Smithsonian.See letter of November 22, 1926. Altogether, Pope left a not particularly pleasant impression on me, and this impression was strengthened when I had spent several days at the Show in London. However much one allows for diversity of taste, there were a lot of features in that Show for which I can find no other explanation than publicity for Messrs. Parish Watson.Parish-Watson and Co., New York, a dealer of art and antiquities. Practically none of the ceramics from the Louvre were asked for, and none from Kelekian’s private collection at the V. & A. while a great many pieces, humbler representatives of types of which the finest examples might have been had from Paris and London, were sent over from Messrs. Parish Watson or their customers. Among the textiles, there were not a few from the same quarter which I think are fakes. You will suspect me of a clumsy attempt at consoling you for not having seen the Persian Exhibition. I would not go as far as that. It was a memorable Show for all its faults. However, it showed me very few things of standing quality which I did not know already; in fact I think Mrs. Havemeyer’s carpetPossibly a seventeenth-century Persian vase rug, Kirman or Isfahan, acc. no. 56.85.1 rugs bequeathed by Horace O. Havemeyer to the Metropolitan Museum of Art. See Maurice Sven Dimand, “The Horace Havemeyer Bequest of Islamic Art,” The Metropolitan Museum of Art Bulletin 15, no. 9 (May 1957): 209–13. was perhaps the only one, except for the painted manuscripts from Teheran, some of which were fine, though by no means a revelation to anyone who knows the collections in Paris and London. I avoided Pope when I was in London, and also Gunther,Frank Gunther has not been identified. whom I used to know years ago and never liked. The Russians did contribute to the Persian Exhibition, sending a number of Sassanian pieces, a few of them first rate. We don’t yet know whether they are going to march for the Byzantine Show, but we expect they are. Since I last wrote to you, we have heard that the Abbé of Saint Maurice d’AgauneBishop Joseph-Tobie Mariétan (1874–1943), abbot ordinary of Saint-Maurice d’Agaune (1914–1931). is sending us the Ewer of Charlemagne.Ewer, gold and enamels, ca. 742–814, Abbey of Saint Maurice d’Agaune Treasury, Vallais, Switzerland. According to tradition, the ewer was a present to Charlemagne from the Calif Harun al Rashid. But its date and provenance have been the subjects of considerable debate. See Peter Lasko, Ars Sacra, 800–1200 (New Haven: Yale University Press, 1994), 16. I think I told you that the Italians are giving us full support. No, you have not yet sent me the $1000 which you are so generously contributing for the Byzantine Exhibition. Will you kindly send me a cheque for it? I had not heard from you, or from Mademoiselle Malye,Thérèse Malye (1886–1951), Mildred Barnes Bliss’s social secretary in Paris. that you wished to give a textile to the V. & A., nor do I know which one you mean. Doubtless Mademoiselle Malye can tell me, and I will take it over to London at the earliest opportunity. Mademoiselle Malye showed me photographs of the things found in Serbia.These objects have not been identified. They do not look interesting. The Persian Show created rather a flutter in Luristan bronzes,Luristan bronzes, a term referring to Early Iron Age bronze artifacts which were recovered from the Lorestan and Kermanshah areas in west central Iran. These include weapons, ornaments, tools, and ceremonial objects and were created by Persian aboriginals known as Lurs. and prices have been keeping up. I expect they will subside presently, and I hope to be able to get you some cheap. I am sure you would not want many. Feuardent still has the engraved sapphire,The Blisses would acquire this sapphire cameo in January 1936. See also letters of October 25, 1930, and February 14, 1931. but far from coming down he is asking for it over twice what its former owner offered it to you for last year. I do not know how much d’AguerreHenri Daguerre, Paris. got for the GuarrazarThe Treasure of Guarrazar, a trove of Visigothic gold pieces discovered between 1838 and 1861 near Toledo, Spain. Much of the treasure was later stolen. eaglesPair of Eagle Fibulas, Visigothic, sixth century, gold over bronze with gemstones, glass, and meerschaum, Walters Art Museum, Baltimore, acc. nos. 54.421 and 54.422. 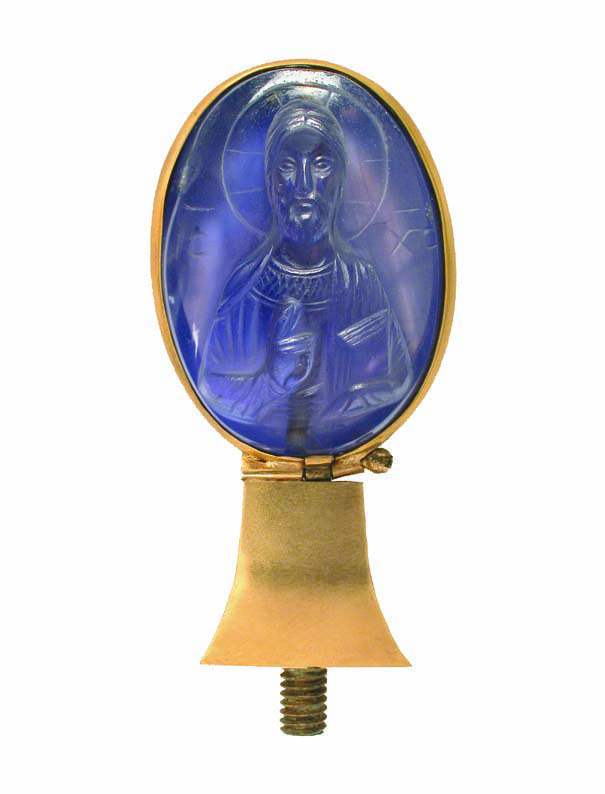 The fibulas were acquired by Henry Walters from Henri Daguerre in 1930. and earrings.Earrings with a Bust of the Virgin and a Bust of Christ Pantokrator, Byzantine, tenth century, cloisonné enamel on gold, Walters Art Museum, Baltimore, acc. nos. 44.300 and 44.301. The earrings were acquired by Henry Walters from Henri Daguerre in 1926. There are contradictory rumours about the Soviet van Eycks. I have heard several people here say that one of them had been bought by Mr. Mellon, but a great friend of his, who has a good deal to do with his acquisitions, tells me that this is not true.A syndicate formed by Andrew Mellon purchased Jan van Eyck’s The Annunciation from the State Hermitage Museum, Leningrad, for $502,899 in June 1930. Mellon gave the painting to the United States government in 1937, and it is now in the National Gallery of Art, Washington, D.C., acc. no. 1937.1.39. I imagine that the Soviets, while very anxious to sell, are doing all they can to avoid their sales being talked about, and are only allowing people whom they regard as serious clients to see the important works they are offering for sale, in order to avoid the effect on the market which would be produced if it were generally known that they were selling on a large scale. As for the Carolingian doorway,See letter of October 31, 1930. I have been unable to get any photograph of it, and have only seen a drawing, which I was not allowed to have reproduced. The owners are very much afraid of having the thing ‘classé d’office’. I will keep at it, and perhaps may eventually succeed in getting photographs. I send you enclosed a photograph which will show you the character of the Chrissoveloni cloister.Zanni (Jean) Chrissoveloni (1881–1926), a Romanian banker. The cloister of the Benedictine abbey of Saint-Genis-des-Fontaines had been decommissioned after the French Revolution and eventually was sold to the Parisian antiquities dealer Paul Gouvert. He had replications of architectural elements fabricated and sold parts of the cloister between 1924 and 1928 to the Philadelphia Museum of Art and to Chrissoveloni, who installed them at the Castle Mésnuls. See also letters of January 6, 1931 ; February 3, 1931; February 14, 1931; and March 17, 1931. (No, I’ll send the Chrisso. Cloister photo. Later—I can’t find it & want to get this off now. )See letter of March 17, 1931. There is no illustrated catalogue of the Persian Exhibition, nothing but an Illustrated Souvenir, which is not good. I dont know yet whether we shall be able to issue an illustrated catalogue of the Byzantine Show. Personally, I think the first thing to make sure of is that good photographs of all the exhibits should be available to anyone who wishes to purchase them. The illustrations in a catalogue, unless it is going to be a very expensive book, are not much good, and if it comes to spending money, I think most people would prefer to buy the photographs of the objects in which they are interested, rather than take a costly book, many of the reproductions in which they would gladly do without. I will send you, as soon as I can find time to mark it, a copy of the ordinary catalogue of the Persian Exhibition. I saw Kelekian’s blue Egyptian vase,The Blisses did not acquire this vase and its identity is unknown. See also letters of April 7, 1930, and February 14, 1931. and like it very much indeed. It is, I think, the finest thing of its sort I have ever seen. I hope to see EkstrandEric Einar Ekstrand (1880–1958), Swedish minister to Argentina who later worked in the Office of the Secretary General of the League of Nations. sometime, at Geneva. I got no chance to talk with him at the Lindsays.Elizabeth and Ronald Lindsay. Sir Ronald Charles Lindsay (1877–1945) was a British civil servant and diplomat who was appointed minister to Turkey in 1925. He married his second wife, Elizabeth (1885–1954) (née Elizabeth Sherman Hoyt), in 1924. Roman WisataRoman Wisata (b. 1909), a Czech violinist and the student and later assistant of Otakar Ševčík at the Innsbruck Konservatorium. has had another big success in Vienna. He is playing here for the Société Philharmonique de Paris on April 24th, and half a dozen people have engaged him to play for them privately. Hayford is in Maine, or rather in New York at the present moment. He will be coming over here for the latter part of the Byzantine Show. But it is a great nuisance that he cannot be here for the arrangement of it; it appears to be impossible for him to leave his father before June. He is doing a lot of work over there, and is now holding a prolonged conference with GoldschmidtAdolph Goldschmidt (1863–1944), a medieval art historian and teacher. In 1930–1931, Goldschmidt was teaching on sabbatical at Harvard University. He was the first German art historian to visit the United States after the First World War. (whose first volume on Byzantine ivories has just appeared).With his student Kurt Weitzmann, Adolph Goldschmidt published Die byzantinischen Elfenbeinskulpturen des X.–XIII. Jahrhunderts, vol. 1 (Berlin: Bruno Cassirer, 1930). Bill is keeping in touch with Sánchez,Apolinar Sánchez Villalba (died 1958), a Spanish dealer of art and antiquities in Madrid. See also letter of March 7, 1931. and will wire me if and when the owners of the Greco decide to allow me to see the picture. My poor secretary is showing signs of exhaustion, and no wonder. And any way, I want to write to you with my own hand, precious person, and tell you how enchanted I was to feel the thickness of your letter, and how grateful to you for it. But—and there’s a big but—I am gloomy over the lack of any indication of how much longer I’ve got to wait, how much longer you are going to be at it. I know I needn’t, and mustn’t, enlarge on this theme, but I can’t suppress my concern. Do give me something to go on. Your sympathy with my livery misery is most welcome, and I’m glad to tell you, what you have probably gathered from my more recent letters, that you would now find me neither miserable nor livery—thanks to the inscrutable fate which makes one make light, at times, of the very things that overwhelm one at others. I am sending you, enclosed, four photos. 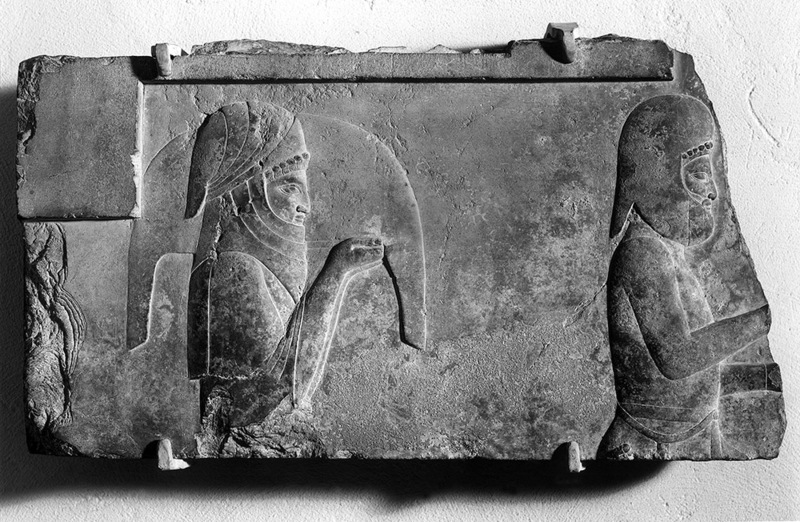 of more Achaemenian reliefs in Stora’s hands.Possibly three of these are referenced in R. D. Barnett, “Persepolis,” Iraq 19, no. 1 (Spring 1957): 63 (France-Louvre 1 and 2) and 64 (U.S.A. Stora Collection ). The two marked ‘Louvre’ have just been retained by the Commission for that Museum,For the Louvre reliefs, see Georges Contenau, Monuments mésopotamiens nouvellement acquis ou peu connus (Musée du Louvre) (Paris : Les Éditions d'art et d'histoire, 1934), pls. xiv and xv. and will be bought, unless the united efforts of Koechlin, DussaudRené Dussaud (1868–1958), a French archaeologist and epigrapher who specialized in the ancient civilizations of the Middle East. He was curator of the department of Near Eastern antiquities at the Musée du Louvre, Paris. and ContenauGeorges Contenau (1877–1964), a French archaeologist and historian of religion who specialized in the ancient civilizations of the Middle East. He was chief curator of Near Eastern antiquities at the Musée du Louvre, Paris. fail to persuade the Conseil des Musées. The other two remain in Stora’s hands—but I wouldn’t suggest your considering any of them. Yours, to my mind, is out of sight finer than the others; it has that steel-like quality of surface, delicacy of cutting, and the surface is marvellously preserved. Not so the others. The latest news is that a combine of U.S. universities and Museums have taken over the Persepolis concession, and that they are putting Hertzfeldt [sic]Ernst Emil Herzfeld (1879–1948), a German archaeologist who specialized in Persian history. He was instrumental in creating a Persian law of antiquities and conducted the first scientific excavations of the Achaemenid capital of Persepolis, representing the Oriental Institute of the University of Chicago beginning in 1931. in charge there. That will mean there’ll be no more fuites“Outflows.” from there. I think you’re greatly to be congratulated on getting, just before it was too late, the most exquisite piece of Achaemenian Sculpture I’ve ever seen. I beg you to keep it in Paris, so that I may see it often. I’m trying to keep informed of what happens to Gualino’sThe Riccardo Gualino Collection, now mostly in the Galleria Sabauda, Turin. Riccardo Gualino (1879–1964) was a businessman, art collector, and philanthropist. See Lionello Venturi, ed., La collezione Gualino (Turin: Bestetti and Tumminelli, 1926). See also letters of March 27, 1929, and October 31, 1930. things. They are in the hands of the Banca d’Italia,In 1931, what remained of Riccardo Gualino’s art collection was given over to the Bank of Italy, with which he had contracted a substantial loan. The bank sold a number of art works but also retained a large selection, which formed the basis for the Gualino Collection housed in the Palazzo Koch, the bank’s head office in Rome. and I’m told the B. d’lt. doesn’t mean to sell them at present. Gualino is at Lipari.Lipari, the largest of the Aeolian Islands in the Tyrrhenian Sea off the north coast of Sicily. My latest information about Italy is rather better. The industrial crisis is as bad as ever, but the banking situation has cleared up, and revealed ToeplitzGiuseppe (Josef) Toeplitz (1866–1938), a Warsaw-born Jew who was managing director of the Banca Commerciale Italiana. (Bca. Commerciale It.) on the top of the heap, and now, for the first time, in high favour with Mussolini.Benito Amilcare Andrea Mussolini (1883–1945), an Italian politician who led the National Fascist Party. That’s all to the good, for the Ital. Treasury badly needs the sort of advice which Toeplitz alone can give it. Mario AlbertiMario Alberti (1884–1939), an Italian economist and director of the Italian bank Banca di Credito Italiano. has been cast out into the outer darkness. Beneduce’sAlberto Beneduce (1877–1944), an Italian economist and politician who was one of Mussolini’s economic advisers. star is in the ascendent. Bill writes rapturously of Spain. He greatly enjoys Mr. LaughlinIrwin Boyle Laughlin (1871–1941), an American diplomat who was the U.S. ambassador to Spain between 1929 and 1933. and his collection of Fragonard drawings.Laughlin assembled a collection of drawings by the French eighteenth-century artists François Boucher and Jean-Honoré Fragonard and others between 1912 and 1935. Elisina is very well, and sends you much love. We’ve had a sad blow in the sudden death of our gardiner-garde at Antigny, who was a very honest fellow and devoted and fairly competent. It is rather hard that, after we have had to dismiss as dishonest or hopelessly incompetent 4 jardinier-gardes in 4 years, the one and only good one we’ve found should burst a blood-vessel and die. A selfish point-of-view, but you’ll understand. Blessings on you, and write again soon, dearest Mildred, and, as soon as ever you can, give me a line on when it’s to be. The Byz. Show opens end May, and lasts till July 15 (or perhaps longer if it’s a success). Can’t you? Drummond’sJames Eric Drummond, 16th Earl of Perth (1876–1951), a Scottish representative peer, a British diplomat, and the first secretary general of the League of Nations. See letter of February 14, 1931. remark about Salter amused me. He took Arthur’s departure very hard indeed: but Arthur has given 9 years of tremendous hard work to the League,The League of Nations,an international organization in Geneva whose principal missions were to maintain world peace, settle international disputes through negotiation and arbitration, and create stability within financial markets. and he hasn’t had a holiday—even such a holiday as this India-China Hetze“Rush.” can be said to be, since the Insurance Scheme started in 1910.The British National Insurance Act of 1911 was an insurance scheme to provide medical and unemployment benefits. Arthur Salter had joined the Civil Service in 1904 and worked in the transport department of the Admiralty on national insurance issues. But it’s a sad fact that, since Arthur left, Jeremiah Smith, Marcus WallenbergMarcus Wallenberg (1864–1943), a Swedish banker, industrialist, and politician and a member of the Financial Committee of the League of Nations and chairman of the Court of Arbitration, set up to decide disputes arising from the Versailles Treaty reparation settlement. and MelchiorCarl Melchior (1871–1933), a German banker. His influence in the German economic community resulted in his 1926 appointment as German representative on the League of Nations’ Finance Committee, where he was named committee chairman in 1928. Following its creation in 1930, he served as a member of the board of the Bank for International Settlements in Basel, Switzerland. have resigned from the League’s Financial Committee,On October 25, 1920, the League of Nations had appointed an Advisory Economic and Financial Committee composed of two sections of ten members each and tasked with “the working out of measures of an economic and financial nature which have been submitted for adoption by Members of the League in accordance with the Covenant of the League.” and make no mystery that they don’t believe the work there will be interesting now that Arthur has gone. De Lorey has returned here from the U.S., having let us down badly where the Byz. Show is concerned. He had promised to work hard at getting us things from Museums and private collections in the U.S., and cash too, and has done nothing except to pass the buck to MoreyCharles Rufus Morey (1877–1955), an American art historian, scholar of Early Christian art, and longtime professor at Princeton University. of Princeton, who isn’t likely to be of any great help. Lorey doesn’t wear very well, I’m sorry to say, and I don’t feel altogether comfortable about him. As for my colleagues on the Organising Ctee. of the Byz. Show, Metman fumes at the mention of his name, and Alfassa has to be restrained from doing him a personal mischief. Salles has been rather a weak reed, too, but he has a valid excuse in really bad health. Happily, Duthuit, Secretary of the Ctee, is a real person.